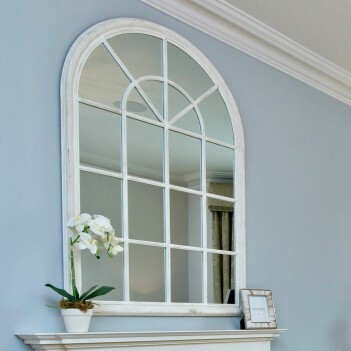 Beautiful arched window mirror that is a head turner where ever you put it. It has a lightly distressed finish and is stunning, making an impact wherever it is hung. Looks fantastic in a grey and white interior scheme. Made from Paulownia Wood and Glass, with the hangers on the rear.